Fruition's Thibaut Scholasch, is featured on The Inside Winemaking Podcast with Jim Duane. The conversation focuses on technical viticulture and the vineyard services that Fruition Sciences provides. Jim and Thibaut go into how these services track vineyard data and how grape growers and winemakers can use the data to make more informed vineyard decisions. The Vintage Report seminar is touched upon. In an industry like AgTech, it’s important to bring together the different stakeholders— governments, farmers, tech companies, and representation of countries from all over the world—in order to unite and solve the most important challenge to us all today: scientists are predicting our population will increase by another billion people by 2020. How do we feed them all? Knowing when to harvest is a key step in the making of a good wine. Why is the timing of harvest so critical? How can picking date affect the sensory perception of astringency in the final wine? The ancient craft of wine making conjures romantic notions of hand-picked vines, and bare feet crushing grapes. However, wine production today is a thoroughly high-tech affair. Degree programs in viticulture and oenology, from Cornell University to UC Davis, reflect advances in the industry. Professors and courses there now focus on topics like “environmental control, and modified atmospheres,” “the genetic engineering of industrial microorganisms,” or “analytical instrumentation,” to name a few. Californian winemakers who don't water their vines are using an age-old technique which reduces water consumption by one million gallons per month. Mapping vineyard vigor for ten euros per hectare: the service offered by Fruition Sciences in France seduces winemakers and grape growers. Its competitors are reacting to the move. The goal is to measure real-time behavior of plants to make sure they are adapting to the amount of water instead of watering when plants look dry. It’s easier said than done and according to some experts, even the best technology may not be enough to save the day. Fruition app's helped Shafer Vineyards save hundreds of thousands of gallons of water. There are some visible symptoms that will show when the vine is in need of water, but it may be too late," Fernandez said. "With this technology we're seeing real time, we can catch the time when the vines really need water." Partnering with Fruition Sciences, the annual award encourages innovators to develop new cultivation methods using limited resources, most notably water. There is a certain level of tolerance that the plant can live with without affecting its activity. You can cut about 40 percent of water from vineyards. We are trying to untrain people from relying on what they see with their eyes. We've decided to be totally agnostic. We collect all the existing data (on-board sensors, drones, satellite images, etc...) and focus on our core expertise, which is data analysis. Wherever I was going, France, Australia, Chile, California, people faced the same challenge: how to measure the irrigation effect on the vine», Thibaut Scholasch remembers. Thibaut and Sébastien created Fruition Sciences in 2008 trying to solve that dilemma that is directly linked to the plant physiology. Recently, Imagine H2O supported the growth of Fruition Sciences, a company whose "sap flow sensors" help farmers and vintners decide precisely how much irrigation is needed to produce their ideal crop so that no water is wasted. [Sap flow sensor] is sending signals, it is immediately available on your iphone or on any web-connected device and you get an alert that say "hey, I am thirsty, please give me some drink". But the plant on Fruition Sciences' side of the vineyard never gave the signal for more water, which translated into a 100% water savings. [...] "The quality that you saw on a dry-farmed vs the irrigated portion, by taste the dry-farmed was superior", Ron Nicholsen, Kelham Vineyard. Ce petit capteur a été responsable cette année de milliers de piscines olympiques qui n'ont pas été gaspillées pour irriguer inutilement les vignobles. Thirsty vines mean concentrated flavor. These sleeves track water flow through the stems, so growers can keep the vines at juuuust the right level of stress. Oakland, California-based Fruition Scienceshas created a web application that crunches data from more than 40 sensors to determine whether crops need more water. The system tracks crop nutrient uptake, aerial photos, and weather and soil conditions. One special sensor tracks sap flowing through grapevines. [...] “So far we have saved anywhere from 40% to 100% of water used for irrigation,” Scholasch said. Fruition Sciences, a start-up from Montpellier wins the Worldwide Innovation Challenge. This start-up is distinguished for its EDENOV project (that stands in French for Data Integration and Expertise for a New Generation of Viticulture Tools). This is a decision tool for grape growers that can optimize their vines management, in particular by reducing their water usage. It incorporates a great amount of data coming from sensors with innovative methodologies of data analytics and knowledge engineering. Fruition Sciences is paving the way for more innovation and disruptive technologies to enter the wine industry. Water consumption: In California, 80% of water is for agricultural use. We are currently working with the Metropolitan water District of Los Angeles to help reduce water consumption in agriculture so that more water remains available for domestic use. By disseminating our concepts and plant measurement methods among farmers and winemakers, we can explain to them how new technologies (including our own) can help optimize water consumption and reduce production costs. Land use: Combining sensors like the ones we have developed with new mapping technologies, winemakers can better define uniform areas within a vineyard. These technologies can help winemakers to fine-tune their settings area per area. It is a dramatic change for yield management and to improve uniformity in fruit composition. Estimates show farmers can cut water usage by 20 to 50 percent. Farmers have been training their plants to be addicted to water, Scholasch says. Not only can some get by with less, many can thrive — particularly the grapes key to California’s famous wine industry. His company’s product is a bracelet worn by vines that transmits data in real time. An algorithm spits out information advising farmers on exactly when and how much to irrigate their crops, taking the guesswork (and overwatering) out of irrigation. Scholasch says estimates show farmers can cut water usage by 20 to 50 percent. French-American friendship lives it up! 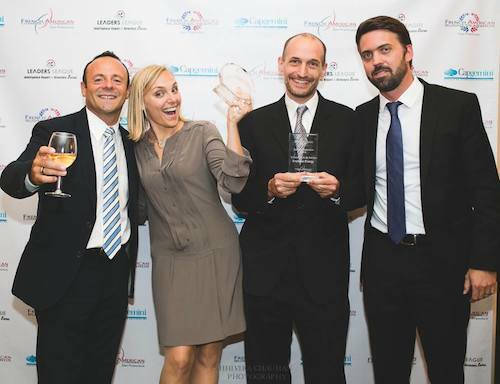 For the Sustainability and Life Science, the award goes to Fruition Sciences, whose ambassador (Virginie Mercier) congratulated the French-American Business Awards initiative. Did you know the Internet of Things? Fruition introduces the Internet of Vines! In minervois, the vineyard of Ostal Cazes, property of Jean-Michel Cazes estate, irrigates according to the needs of the plant thanks to the continuous recording of sap flow, a technology developed by Fruition Sciences. Mr. Fernandez opted to try the Fruition Sciences data package with sap sensors after using pressure bombs to gauge transpiration for two decades. After just one season of watering vines in Shafer Vineyards’ Napa Valley estate property by a relatively new method of tracking real-time data on how much soil moisture they actually need, Director of Winemaking Elias Fernandez estimates he cut water use by as much as 100,000 gallons in just those seven- and five-acre test blocks. “Your sanity checks, vine water use measurements (from aerial pictures and stratified sampling), and fruit maturity analysis... All of this data is actually going to mean so much more when positioned on a map and correlated with other information. Fruition has created a mesh network of data that is going to disrupt the role of consultants, technical institutes and experimental research. Fruition's system will self-generate all data that is currently established through means of models, reference sites, observatories...” (Bruno Tisseyre, Professor in Precision Agriculture at Montpellier SupAgro). Fruition Sciences met French President in San Francisco to talk about innovation. Fruition Sciences - founded 6 years ago by 2 Frenchmen- is now the leader in vineyard water use monitoring. Its cutting-edge technology consists of sensors installed directly on the vine to monitor in real time its water needs. Based in Montpellier and California, Fruition Sciences helps better understand terroir specificities and vintage conditions to improve fruit quality, yield and optimize resources. Fruition Sciences is now present in 4 countries (France, USA, Argentina and Italy) and works with more than 90 wineries, including prestigious Château Latour. Thibaut and Sébastien, the founders, have been honored to present their technology to the presidential delegation and share on what are the future key success factors. Thanks to the monitoring devices supplied by Oakland-based Fruition Sciences, Shafer Vineyards says it has saved more than 160,000 gallons of water in the past year. Dana Estates and Silver Oak Winery, also in Northern California, have also started using the sensor-software combo to keep an eye on their vines. Cameron Vawter, the director of winemaking at Dana Estates, says he has saved more than 2.5 million gallons of water annually across all three of Dana’s vineyards since adapting Fruition Sciences’ technology in 2006. Since Silver Oak started using Fruition Sensors, its Cabernet Sauvignon improved in quality. There is now solid evidence that "a vineyard can sustain much less irrigation that it has had in the past", Scholasch said. Using technology developed by his firm, clients have demonstrated "you can reduce drastically irrigation without have negative impact on wine quality. This has been corroborated by both vineyard managers and winemakers." What’s "really important," he continued, is for growers to "minimize irrigation prior to veraison (onset of ripening) — refrain from watering prior to veraison and then targeting more water following veraison (when grapes take on color). This is a big shift in opinion. In the old days, you gave (the vines) more water before — which only just increased what the plant wanted after veraison." Bank of the West and Fruition Sciences recognized [on January 21st] the winner and two finalists of the Vintage Report Innovation Award Presented by Bank of the West for their demonstration of innovation and sustainability in viticulture. A vine’s water-use can be measured just as accurately. Fruition Sciences, a company founded by two French graduate students, applies heat sensors to vine branches to measure how fast sap flows through them, and thus how much water is transpiring through the plant. The sensors wirelessly transmit the data every 15 minutes, and send an alert if irrigation is needed.
" des capteurs installés dans différents endroits sur la propriété « écoutent » comment les vignes « respirent » le soleil, c’est comme écouter le sang circuler dans les veines d’un être humain. Les données sont récupérées, analysées, transmises au propriétaire qui prend les décisions pour temporiser éventuellement l’irrigation de la vigne qui aboutira sur un « gros » ou un « petit » raisin qui va définir si le cru sera bon ou pas… car c’est au tout début du processus que se décide la qualité d’un cru. " High tech is having quite an impact in Napa Valley, one of the world premiere wine destinations. Vintners are using new tech tools to help them in the winemaking process. At Dana Estates, in the Napa Valley, head winemaker Cameron Vawter is using a technology from Oakland-based Fruition Sciences. It can essentially measure a vine's heart beat using sensors. "Using that [technology], we can make decisions about whether we add an irrigation or whether we hold an irrigation", says Vawter. It shows on a detailed graph how much water is needed by the month, by the day, even by the minute. "It can make a huge difference in the quality of the wine. Using this technology, we started dryfarming a lot of our vineyards. I have vineyards today that have still to this day been non irrigated in 2013, which is a very dry vintage here in Napa Valley and especially here at Dana Estates." At Convergence Paris, "vine nerd" Sebastien Payen presents a VERGE Talk about how his company, Fruition Sciences, is using sensor technology to dramatically reduce water usage in wine production, transforming ancient growing practices towards a more sustainable model. Shafer Vineyards has a few new hi-tech systems to thank. "It's always good to look at technology and use it to see if your gut was the correct way to go after all," Fernandez tells The Verge. [...] "It used to be, we'd just go by feel, and say let's put out five gallons of water per plant," Fernandez says. "With Fruition you can tell if 5 gallons was way too much or not enough." Now big data is playing a role in helping growers make the perfect bottle of wine. "It's hard to quantify, but we learned a lot about how to farm our vineyard to be optimal," Austin Peterson, winemaker at Ovid Napa Valley, a St. Helena, Calif.-based winery told us. "As a consequence of that, we've seen improvement in our wines. Our last couple of vintages got our best scores yet." "We’re getting better fruit character, and the tannin structure has changed in experimental blocks," Baron said. "We’ll need a few more years to understand the changes, but I’m convinced enough to continue to do it, even if the only benefit is the water savings." The award recognizes "innovation and experimentation in viticulture" and will fete top achievements during the 2013 vintage. The honor will note groundbreaking methods, practices and approaches during the harvesting season. And, yes, the bank wants to honor wineries that practice sustainability. For now, the biggest upside is more control and consistency over grape development. But such precision also can help reduce water consumption, an advantage that could become increasingly attractive as climate change disrupts weather patterns. Another powerful tool helping to improve efficiency and grape quality has been the ability to measure vine water needs with sap flow monitors. A collar around the vine’s trunk turns the plant itself into a sensor by measuring the flow of water through the vine. “The vine itself becomes a sensor,” Goldberg says. This enables him to walk the fine line between stressing the vine to produce top-quality fruit without compromising the overall health of the plant. When does a vintner water his grapes? Most of the people trust experience, a few of them rely upon what the neighbor does. When in doubt, one often considers that "more is better". This is untrue says Thibaut Scholasch. 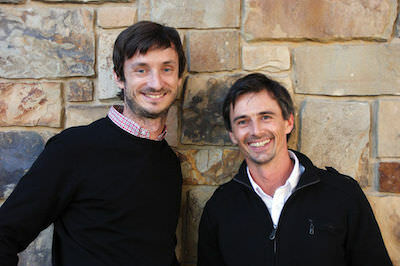 With his business partner Sebastien Payen, he brings new technology in the vineyard. This not only saves on water use but it even improves the wine taste. We then headed into the lab, where Remi walked me through the science of irrigation management by showing me the computer software from Fruition Sciences. It was tremendously geeky — and absolutely fascinating. (In fact, Wired just published an in-depth feature on the company. To a growing cadre of A-list winemakers, there’s actionable intelligence in the data. Many of Fruition’s clients are altering their irrigation techniques, turning laggard vineyards into top performers and using far less water than they ever imagined. Along the way they’re extracting lessons that could extend far beyond this rarified corner of agriculture. By gaining insight into the relationships between water, sunlight, yield, and taste, Fruition Sciences is showing the way for farmers of all stripes to increase productivity and quality in a world of shifting weather patterns and decreasing supplies of freshwater. Already, the Bay Area is home to a number of innovative water startups taking advantage of this opportunity. Companies like Driptech and NextDrop help people in underdeveloped regions through advanced irrigation techniques, and others like Fruition Sciences and WaterSmart take a highly scientific approach to water conservation. 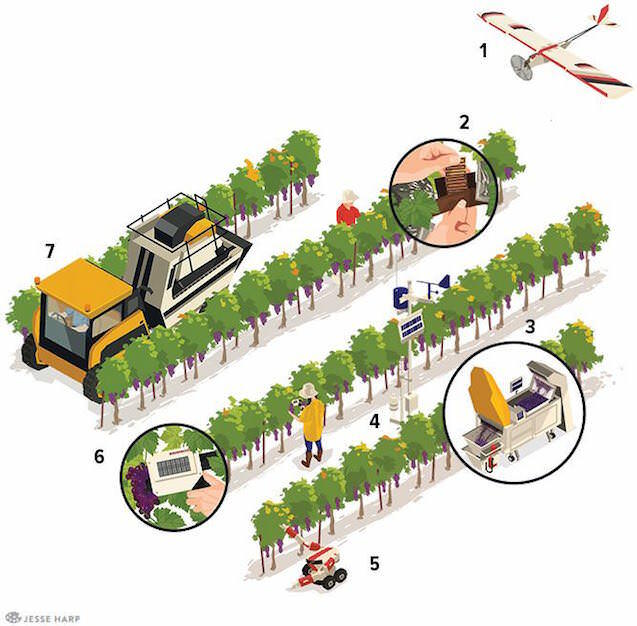 David Gates, vice president of vineyard operations at Ridge Vineyards, has installed a sophisticated tool for tracking field conditions and measuring the transpiration rates of vines planted at the winery’s Monte Bello Vineyard in Cupertino, Calif. The vineyard team collaborated with technicians from Fruition Sciences to build a network of sensors that reduces water consumption and improves the quality of the grapes. By bringing more science to the table, we felt we could get people to rethink the way they water, and also the way they plant and choose varietals—all of these issues are connected to sustainability and water conservation. Overall, the late season start, combined with the high soil moisture availability, maintained a high level of water supply to the vine until later in the season (i.e. veraison). This caused the level of vine water use to be high compared to previous years. The consequences of that are: a) Delayed maturation / b) Larger berry size. The water equation is a tricky one. But I've rarely seen it summed up so succintly as in a Powerpoint slide prepared by Thibaut Scholasch of Fruition Sciences, one of Moueix's consultants, who works for a handful of other top names: Ridge, Dana Estates, Ovid, Harlan, Araujo, Spottswoode and so on. (Fruition's work with precise water-need measures are limited to those with deep pockets, as witnessed by that list. The hope is that the emerging technology will grow more affordable in time. Scholasch believes not only that too much water is used in vineyards, but that poor water management adds costs and waste all through the winemaking process - leading to weaker flavors, less productive vineyards (the ripe style can require severe cropping) and extra effort in the winery (as water is added and the wine's chemistry corrected). Fruition Sciences, which operates in both California and France, came first among 50 teams in Imagine H2O's global competition aimed at building a "Silicon Valley" for water. The prize rewards the business plans with the greatest promise of breakthroughs in the efficient use and supply of water, and Fruition was able to show significant water savings for nine California grape growers that used the monitor.